A neighbour rescued a man in his late teens and a woman in her 30s following a fire at a house in Londonderry. 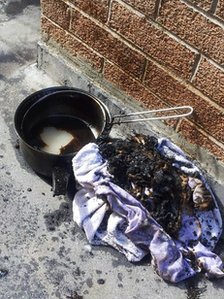 The fire is believed to have started accidentally in a chip pan. Two fire crews extinguished the blaze at Yeats Court in Ballymagorarty at around 2330 BST on Sunday. The teenager was treated by fire crews for burns and the woman and neighbour were treated by paramedics for the effects of breathing in smoke. All three were taken to hospital by ambulance. Fire has ripped through a bus depot near Newquay. The fire has destroyed at least 37 buses – a third of bus firm Western Greyhound’s fleet. At its height, crews from St Columb, St Dennis, Newquay, St Austell, Perranporth, Wadebridge and Launceston were battling the blaze at Summercourt. The fire in Summercourt, near Newquay, broke out in the early hours of Monday morning. In Cornwall about a third of services are not operating or have been delayed, although services are running normally in Devon. Western Greyhound has been operating buses in both counties since 1998. It describes itself as a “locally based, family-run business”. The cause of the fire is being jointly investigated by Devon and Cornwall Police and Cornwall Fire and Rescue Service. No-one was hurt but almost forty buses have been destroyed. 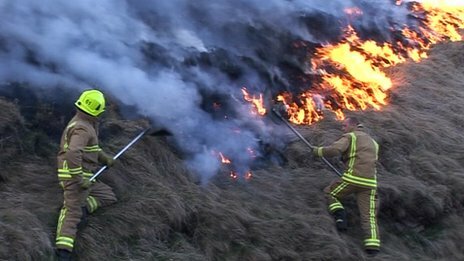 About 90 firefighters from two counties tackled fires between Mytholmroyd, in West Yorkshire, and Littleborough, Greater Manchester. At its height, the fire front stretched for more than one mile (1.6km). 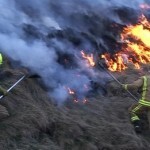 Fire service officials hope predicted rainfall will dampen moorland and the weather will help prevent further outbreaks. Robin Ward, of West Yorkshire Fire and Rescue, said: “It’s very much an on-going situation, we’ll be monitoring it for the next couple of days. Pete Buckley, from Greater Manchester Fire and Rescue Service, said crews had been forced to withdraw from the hillside as darkness fell on Tuesday evening “for safety reasons” and were then tasked with protecting “isolated local buildings”.